DreamStarter is a promoter of innovative social projects for citizens, spearheaded through its first twelve projects. 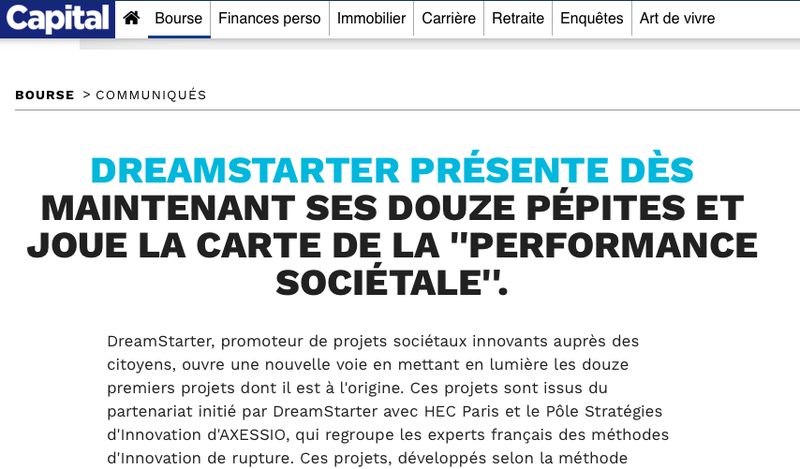 These projects stem from a partnership initiated by DreamStarter in collaboration with HEC Paris and the AXESSIO Innovation Strategies Pole, all of which assemble French experts on methods of innovative breakthroughs. These projects having been developed according to the Blue Ocean Strategy Innovative Breakthrough Method, are funded by DreamStarter and selected for their “social performance.” All of these projects are financially viable, and have a positive impact on our society. Founded in 2015, DreamStarter is an audacious actor who is going to challenge preconceptions and enable large-scale social projects to emerge through direct citizen involvement. DreamStarter has shown that financial viability and social viability are not conflicting endeavors. By positioning itself behind the assertion that chosen projects positively impact our society yet remain profitable; DreamStarter sets itself apart from others. Selected by experts in innovation, these projects are being monitored by DreamStarter, who brings active marketing and communication support to introduce these initiatives on a large-scale and make them visible to the greater public. By becoming a customer first and foremost, DreamStarter can contribute to these initiatives either directly or indirectly through their ideas, financial support, or even by joining the initiative. Proud to carry this new vision that reunites both social and economic aspects, DreamStarter has once again decided this year to be a Blue Ocean Awards sponsor, and to be a member of its jury. The Blue Ocean Awards will take place on November 30, 2017 at the Ministry of Economy. Axelle Lemaire, Secretary of State in charge of Digital Technology and Innovation will be the Master of Ceremonies. On this occasion, DreamStarter will present the “Social Blue Ocean Award” to a French SME that will have created a new market through its innovative social services.